Sorry - Website down for maintenance! I had to have some heavy maintenance done to the site over the past few days, so please apologise the absence for a couple of days. Good news is everything is up online and running smoothly again. The screencaps, extended summary and filming locations info for the next due episode are in the works already. I am also about to supplement the media page by a couple of press release and set photography. There will be a new sub-section for photos which have no source given on them, although some of these were probably issued by ABC and other known parties, but when press info sheet (and, thus, the source) is gone it is hard to tell which company actually released the picture in question. 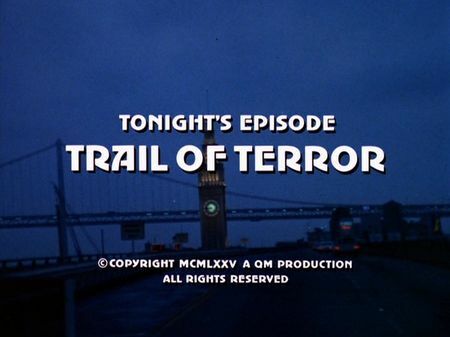 I have just added the screencaps for Trail of Terror to the episodes' page. A group of four Navy sailors - Pete, Beau, Doug, and J. W. Flowers - arrives at the pier, seeking their buddy Marty, who was charged with the sale of imperial jade worth some 100,000 Dollars which they had stolen in Asia on their last assignment. The somehow overexcited group soon realises their friend had closed down his shop for good before they landed in San Francisco, so they are urgently looking for some hints on Marty's place. Just the moment Marty is about to leave for the airport - and ready to leave his girlfriend, Nancy Mellon, high and dry, Marty gets the surprise visit from his old blue-dressed Navy friends. First, Marty tries to purport he just got some 10,000 Dollars since the sale was too hot. Of course, his former buddies do not believe in what Marty says. Following a quarrel, which Nancy listens to from the room next door, Marty is knocked down by bad-tempered Doug, resulting in even more trouble when the group realises that Doug had killed him. Nancy makes it out of the house and even out of sight, but the Navy men are alerted and on a lethal mission: finding the money as well as the eye witness to their crime. When homicide is called in to Marty's place, Mike and Steve soon identify Marty's girlfriend, and Mike wants Steve to track down Nancy as she is their prime suspect for murder. Following a search issued by the SFPD, Nancy is arrested for murder at her parents' house in Sonoma County. Little does Nancy know that the four sailors were just about to locate her domicile, but although they cannot intervene they are now keeping close on her trail. When Steve is arriving in the Redwoods, ready to get Nancy back to San Francisco, the sailors are preparing their coup. Following a forced car accident, Steve and Nancy need to flee into Redwood Forest in order to save their own lives. Mike, in the meantime, gets back to Marty's aparment, searching for a lead to what he is still assuming - that Nancy killed her boyfriend. When he finally locates the bag and the money in the chimney, perspectives change and Mike awaits the return of Steve together with the suspect, Nancy. In the meantime, all the action takes place in the Redwoods, with the sailors going crazy - not only madcap Doug but also leader Pete. When the other two of them - J. W. and Beau (who actually is Doug's brother) - realise their buddies are ready for everything, they subsequently resign. J. W. leaves the group but Beau tries to stop his brother. In the end, Steve is wounded and Nancy is saving his life - and it is only the two brothers among the sailors, Beau and Doug, who survive the chivvy, ending up detained by local Sheriff Kenney and Mike who assists the search by helicopter. The beginning takes us down to Fishermans Wharf where the sailors land at Pier 41, and they are leaving the place westbound towards Fishermen's Grotto and Alioto's. They are arriving at Marty's indian jewelry store by cab in the southern Marina District, and try to locate him in nearby 'Paul's Saloon'. Marty's and Nancy's apartment is located in North Beach, and that's also where the sailors are talking to Nancy's friend in front of a local market. Nancy's escape takes us northbound to Guerneville in Sonoma County where the rest of this episode and the hunt takes place. 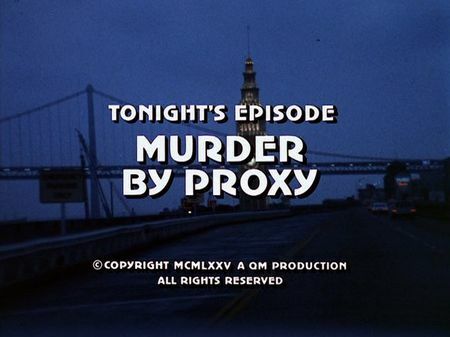 The screencaps for Murder by Proxy have just been added to the episodes' page. A residential neighbourhood has suddenly seen a remarkable rise of violent crime committed against private homeowners. Leo Steiner, owner of a local printing company, approaches Mike for help since the crime rate has come up to 300% of the city's average over the past few months, including property damage and threat of physical violence. Although it is not homicide's business, Mike tries to help, and soon after our two cops started their inofficial investigation, the case is getting a homicide matter when Leo Steiner is found dead in his printing facility. Mike and Steve find out that the escalation of violence may be tied to the fact that all the homeowners in the neighbourhood had been recently approached by Quincy Lloyd, a local real estate broker, making extraordinary high offers to buy their properties. Although Lloyd appears to be the fly-by-night agent that he actually is, Mike needs the (illegal) help of Leo Steiner's son, Johnny, who breaks into Lloyd's office, searching for hints on his father's death. Officially, Mike books John Steiner for burglary, but actually a short glimpse insinde the documents stolen by Steiner provides another decisive lead: Lloyd is obtaining the real estates on behalf of Communication Consolidated Inc., a major corporation - for which violence seems to be an effective instrument when money does not convince owners to sell off their properties. Just the moment when Mike and Steve are talking to Lloyd in his office, a car shooting and a following turmoil of residents against the perpetrators deliver the final piece in the puzzle, supported by a disagreement between Lloyd and his principle inside Communication Consolidated, Tom Fitz. Another episode primarily filmed in the Potrero Hill district, starting out at the corner of Mariposa and Texas Streets where Quincy Lloyd's henchmen are threatening grocery store owner Jules Werth and his pregnant wife Sally by trashing their car. Leo Steiner talks to Mike and Steve in front of the Hall of Justice building at Bryant Street, soon after our two cops are driving up to his printing facility located in a (now demolished) warehouse close to 20th and Indiana Streets, whereas Quincy Lloyd talks to homeowner Mr. Buckey on Connecticut Street; later on, Mike and Steve also interview several homeowners (including Mr. Buckey) in that same neighbourhood. Lloyd first meets Tom Fitz in front of the Cathedral of Saint Mary of the Assumption, and later in Fitz' house in the Sea Cliff estate. Following Steiner's refusal of Lloyd's final offer, the latter talks to his henchmen at Aquatic Park and sends them out to solve that problem. The hounding for the henchmen starts with the shooting in front of Quincy Lloyd's office at 20th and Connecticut Streets, then to Werth's grocery store at Mariposa and Texas Streets, downwards Mariposa to the intersection with Mississippi Street where their cruise comes to a sudden end. The hounding continues by foot down Mississippi Street towards 17th Street, and ends on the railroad tracks alongside the Courtesy Auto Wreckers warehouse. Finally, the epilogue takes us South of Market where Mike, Steve and John Steiner observe construction works for the CCI's new headquarters building which actually is the 4th & Folsom block where Moscone Center was built on some five years laters. 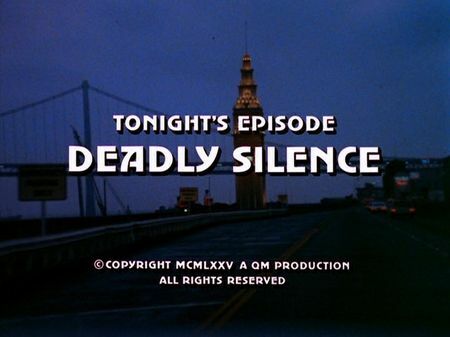 I have just added the screencaps for Deadly Silence to the episodes' page. While cruising the streets and Mike making fun of Steve's and Jeannie's plans for a 'secret birthday surprise party' later that day, Inspectors 8-1 are called in for a liquor store robbery in South of Market. It soon turns out that the armed robbers are ready for everything, shooting right at the cops, with Mike hitting one of the gunmen in the belly but the trio can finally make it into the getaway van and escape. Being on the run, the van hits Mike at high speed and leaves him lying unconscious on the street. Mike is taken to hospital and - apart from a cerebral concussion - he soon realizes that he is almost deaf on the left ear. He would not tell anyone, of course, since he is not interested in being temporarily suspended from duty. Meanwhile, the robbers arrive in their Potrero hide-out, and soon after the one who was shot by Mike dies. We as the audience learn that the trio consisting of Rudy Nolan, Jeff Dixon, and his wife Jodi - who is Rudy's sister – wanted to make some money in order to get home and have a better life. When Jeff dies, Jodi vows revenge against the police officer who shot him, whereas Rudy tries to convince his sister that they should get out of the city immediately. Little does Mike know that Jodi Dixon is almost permanently on his trail, trying to get an opportunity to wipe out the man who killed her husband. Some coincidences help saving his life in the first instance, but Jodi would not give up. After a dispute with Jodi, Rudy is trying to get away, but a patrol recognizes his van, and following a chase and a shootout - in which Mike puts his life at risk due to his paracusia - Rudy is also shot, and Steve removes Mike from service for good. While Steve and Tanner are teaming up in order to identify the third suspect - finally, for murder, since the liquor store owner has died in the meantime - Mike stays at home, reluctantly, thinking about the option to have an ear surgery for his deafness which, however, could also result in total numbness and dismissal from occupation for ever. The other option would be non-surgical, getting a hearing aid and a desk job for the rest of his career. While taking a stroll in his neighbourhood, Jodi Dixon makes another attempt on Mike's life. He can get away though, and Jodi makes another decision: taking Jeannie hostage in order to finally prevail. This episode ends up in a dramatic and conciliatory climax in which Jeannie is freed from Jodi's captivity, and Mike is getting his hearing ability back through the proposed ear surgeryaves. Almost entirely filmed on Potrero Hill, this episode starts out in South of Market, right at the corner of 6th and Jessie Streets (the Sonoma Market is still there, by the way). The robbers' hideout is located close to 19th and Wisconsin Streets, just two blocks away from Mike's home at 768 De Haro. Mike is taken to the Davies Campus of CPMC at Duboce Ave., and later on visits his old buddy and former partner at the former Northeast Police Station in the Dogpatch on 3rd Street. Rudy Nolan is traced by police starting at Broadway and Embarcadero, and ending in the Industrial Harbour area close to Pier 70 where he is shot to death. After being temporarily removed from active duty, Jeannie takes Mike home from the SFPD headquarter's parking lot. Later on, Mike is strolling around Potrero Hill, the young skater irritates him due to his deafness in front of a hobby shop at Connecticut Street, and soon after Jodi tries to shoot him down at Southern Heights Avenue and Carolina Street. Following the failed attempt on Mike's life, Jodi takes Jeannie hostage in front of Mike's house, then lets her make a call in the Marina, and finally gets her to Battery Chamberlin in the Presidio. 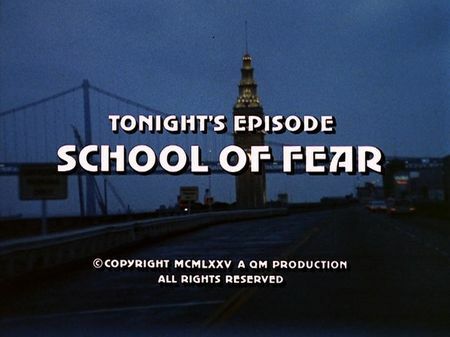 The screencaps for School of Fear are now accessible through the episodes' page. When a teacher becomes victim of violence among teenage students of rival gangs at a high school, Leopold Summer, a dismissed and old-fashioned teacher kidnaps four of the most troublesome pupils in order to teach them lessons for life in an abandoned school building. His highly-sophisticated methods of getting the students into his 'class-room' as well as his obviously serious effort to help them getting out of the misery they're in, however, impresses only one of the kidnapped guys. The other three are somewhat between anger and hatred, although time tells that in at least two of them a sparkling flame of reason is still burning. Mike and Steve are hunting for Richie Martino - one of the two who are suspected to have shot the teacher to death - but Martino is also chained to the school desk in Mr. Summer's private class-room. Meanwhile, Steve is also approaching the abandoned school while following a tip - and finally gets chained as well. There's an interesting and intriguing development among the students without delivering an implausible plot, and all this peaks in the final leg of this episode when the father of the sole female student, Judy Harris, gets a tip from a bummer as to where he had found his daughter's wallet (Summer had informed Judy's father that he was holding his daughter for good and that he would not do her any harm). Of course, furious Mr. Harris is about to free his daughter - who tells her father (against the truth) that Summer had 'his hands all over her body' - but Mike can impede another crime last-minute. This does not prevent Summer's death, though, who roams around in the old building, hearing voices from the past, and finally crashes through a derelict floor. This episode starts out at the 'Manual High School' which actually is George Washington High School in the Outer Richmond. Following the death of teacher Walter Randolph, Summer and the school's Vice Principle, bandy words in old Holy Cross Church at Eddy Street in the Fillmore District. Summer's house is located in the Corona Heights, and he first picks up Jeffers at a 'dayworker meeting point' at Eddy and Divisadero, then kidnaps Pruitt in front of his parents' house in the North Panhandle. The abandoned 'Thomas Paine Academy' is supposed to be in the Western Addition (Summer turns into an 'alley' just off Scott and Ellis) but the actual estate was a deserted orphanage located between Ingleside Terraces and Westwood Park (one can recognize the tower of former El Rey Theatre in background when Mr. Harris arrives in his Ford Mustang). Judy Harris' father, by the way, meets the bummer at the corner of Scott and Ellis, the same location where Summer turned onto the alley which is supposed to end up in the estate of abandoned 'Thomas Paine Academy' school. Special thanks to David Gallagher of the Western Neighborhood Project, who finally identified the area which is known as 'Dorado Terrace' nowadays. The remainders of the huge orphanage complex were demolished shortly after this episode was filmed, making space for a condominum project.